Laser Technologies Inc. Is an ISO 9001: 2008 Certified company. Our Quality department is equipped with state-of-the-art measuring equipment designed to precisely measure or reverse engineer our customers motor and generator assemblies, electrical steel laminations, and 3Dimensional fabricated products. Laser Technologies can also help furnish chemical analysis and elongation testing for electrical steel products. If there is a specific test or quality requirement pertaining to laminations or electrical steel not listed on our site that you are interested in discussing, please contact us for more information. Optical Coordinate Measuring Machine (CMM) - This piece of equipment is a non-contact measuring machine excellent for reverse engineering existing laminations when drawings are not available as well as inspecting manufactured laminations against customer-supplied drawings. Inspection reports are generated comparing the manufactured part geometry against the specified print dimensions. Key features are measured and recorded as in or out of tolerance based on drawing specified tolerance. Measuring accuracies are rated to a range of .00020". Maximum measuring envelope is 60"x48"x6". 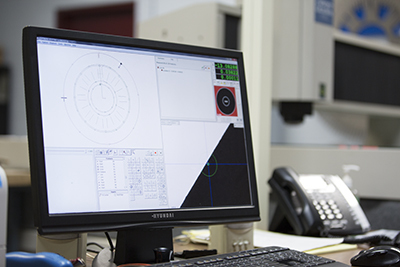 Laser Technologies' lab is equipped with two optical CMM's ready to expedite the reverse engineering process within 24 hours of receipt, without bottlenecking our day-to-day inspections. Probe Style CMM - This piece of measuring equipment is a contact measuring machine used for reverse engineering and measuring assembled motor and generator cores as well as thicker work pieces such as end plates, pole laminations, pressure plates, and rotor rims. 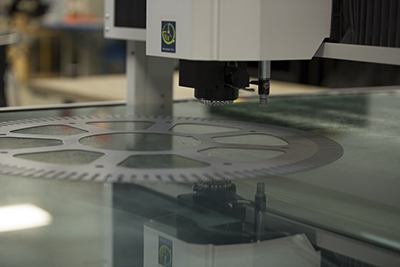 Laser Technologies qualifies all fixturing, tooling, or gauges built for use on the shop floor. Measuring accuracies are rated to 4.9 = 5L/1000um. Maximum measuring envelope is 47.25"x 118.11"x 39.37". Faro Measuring Arm (CMM) - This piece of equipment is a 6-axis measuring arm used for fabricated assemblies or Motor cores which do not fit on the Probe style CMM. Volumetric Accuracy is rated at +/- .0009". Maximum measuring envelope is 72" x 72" x 72"
Optical Comparator - Used to visually verify the integrity of the cut or punched geometry under magnification. Precision Measuring Instruments - Qualified hand held measuring instruments, gauges, and pins used in day-to-day operations to check part features. All instruments are calibrated and certified annually by outside auditors. 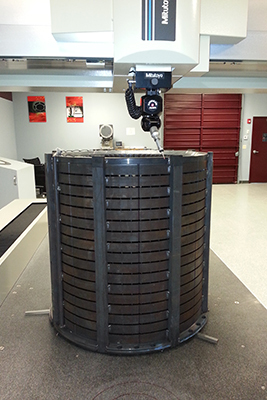 Epstein Testing (Core Loss Testing) per ASTM A343 - This test method covers tests for the magnetic properties of basic flat-rolled magnetic materials at power frequencies (25 to 400 Hz) using a 25-cm Epstein test frame and the 25-cm double-lap-jointed core. It covers the determination of core loss, rms exciting power, rms and peak exciting current, and several types of ac permeability and related properties of flat-rolled magnetic materials under ac magnetization. Interlaminar Resistance Testing (AB Testing) per ASTM A937 - This test method covers a means of testing the interlaminar resistance of electrically insulating coatings as applied to adjacent laminations of flat-rolled electrical steel, under predetermined conditions of voltage, pressure and temperature. It indicates the effectiveness of surface coatings on electrical sheet steels for limiting interlaminar losses in electrical machinery. The interlaminar resistance is measured directly in units of resistance (k?). Franklin Testing per ASTM 717 - This test method covers a means of testing the surface insulation resistivity of single strips or punchings of flat-rolled electrical steel under predetermined conditions of voltage, pressure, and temperature. Stacking Factor Testing per ASTM A719 - This test method covers measurement of the lamination factor of a specimen composed of strips cut from magnetic material. Ductility Testing per ASTM A720 - This test method covers determination of ductility utilizing Epstein test strips and a bending device for bending the strip over a predetermined radius. It is intended for commercial silicon-bearing steel sheet or strip of non-oriented types in the thickness range from .010 to 0.031 in. [0.25 to 0.79 mm], inclusive. Coating Adhesion Tape Test (Cross Hatch) per ASTM D3359 - This test method covers procedures for assessing the adhesion of coating films to metallic substrates by applying and removing pressure-sensitive tape over cuts made in the film. Coating Thickness per ASTM E-376 - This practice covers the use of magnetic- and eddycurrent- type thickness instruments (gauges) for nondestructive thickness measurement of a coating on a metal substrate. Material Crown Testing per ASTM A971 - This test method provides a procedure for measuring edge taper and crown of flat-rolled electrical steel coils as produced at the steel mill. Thermal Aging - Testing procedure which compares Core Loss values utilizing Epstein test strips before and after inducing samples at a specified temperature over a predetermined period of time.